Many of you have asked for the ability to download your Power BI Desktop reports from the web service, and you now you can do just that! 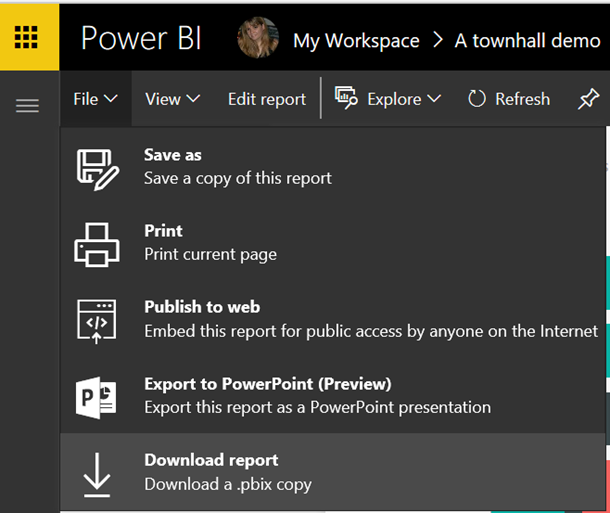 You will be able to download any report that was published from the Power BI Desktop from this point forward. With this feature, you will be able to recover a file from the service if you lose the original from your local computer, download someone else’s report if you are part of a group, and get the latest version of the report if you made changes in the web. You can find the download button under the File menu of the report when viewing the report in Power BI on the web. 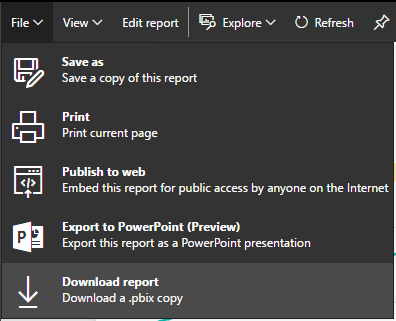 For now, the preview feature can only download reports that originated from Power BI Desktop. If your report originated from the Power BI service either via a cloud dataset or a content pack, we can't open it in Power BI Desktop yet. Stay tuned for updates in this area – we plan to extend this feature to other types of reports. To receive an update when we add these features, be sure to vote for this feature request on our ideas forum. To take advantage of this feature, the report has to be created in the Desktop first and then either uploaded or published to the web any time after this update. You can learn more in our help documentation. For Power BI admins, you can always disable this feature by turning off the ability for users to export data in the admin portal. In addition, this action will be included in audit log search in the Office 365 Security and Compliance Center.